Oh Inkyyyyyy...... can you see the big red flag waving over Buster's head????? You've gotten some good advice so far. Anytime you're selling a horse remember it's not called "horsetrading" for nothing...ALWAYS give yourself a haggle cushion, because most people will want to negotiate. Shantel--sounds like her feet are finally under control. When you find a good shoer, take real good care of him/her. I've learned that the hard way. Dreamin--nice saddle. I never realized what a science finding a well-fitting saddle is. I just know that my 2 high-withered beasts do fine with the Frysos that we all at my barn ride in. But since I'm still in training wheels on Jag (read: western saddle ) and haven't actually put my own dressage saddle on yet I may have to cough up for another one. I'm prepared just in case. Speaking of which, Jag is doing really well. His next show is this Sunday, and he's doing T-3 & 4 again, up in Moorpark. He and I are finally starting to click a bit. I'm just getting used to his huge stride and how forward he is, he's getting used to me trying to be consistent and staying off his face. I think I've figured out that his ear pinning is kind of an attention-getting thing. He only does it when I have food, or when he's in the crossties either being saddled or unsaddled and I'm not as attentive to him as he would like. He and Pokey are next to each other now, and Pokey's like the babysitter...all the horses nicker at him and he's a big friendly hi-I'm-Pokey-what's-your-name kinda guy. He and Jag seem to have buddied up really well, and I'm not seeing the scratches, scrapes and bites on either of them that I was seeing on Jag before. Anyways, we're just humming along. No pics yet, but I will have a camera with me on Sunday, hopefully it won't be such a zoo like the last show was and I'll be able to take some shots of him all dressed up. Upon taking him out of the pen, he took one step forward after I had stopped (this is the pony that will now follow me and stop +/- 1 step from my shoulder without a lead) She took the lead from me, jerked him back a couple steps, and promptly said he was spoiled. In addition to saying he was spoiled she mentioned "So you found him at a so called rescue?" She then slapped him arounnd a couple places, to see how spooky he was (his skin just twitched and he looked up in surprise) and then she went looking for a whip so she could test his hind leg sensitivity. She asked me "Why on earth would you take on such a big project you couldn't handle?" My bad sorry, I wasn't originally planning to move to Jersey. My plan was to spend quite awhile building up a severe lack of trust in humans, then slowly begin saddling and bridling him. This all took course in about 5 minutes time. And she kept snatching the lead from me and jerking it whenever he would move his head. She brushed off her hands, told me she wouldn't offer much for him, that he was probably really stubborn and spoiled, and that she'd give me an email back tonight so I wouldn't be in limbo. Lets just say I just spent the majority of the time agape and speechless! I'm not sure I would consider this a good home for him. I don't think she would abuse him, not at all! But I'd like to see him go to a home where he WOULD be slightly spoiled and loved on after his history if you know what I mean I know first impressions can be deceiving but she just seemed....hard and relentless. Not from the way she was handling Buster, I was fine with that, I could see she knew what she was doing, but her overall *aura* I guess you could say. Shantel - glad you got Layla's feet figured out, what a relief! Deequeue, can't wait to hear how Jag does at the show. Inky, that woman most certainly does not know what she is doing. Slapping and jerking a horse around is not an experienced horseperson in my eyes. No way would I sell him to her. My saddle arrived today, but it was late so won't get to try it out till tomorrow. It is very nice. I hope it fits! Shantel - Sooooo glad to hear that everything is finally working out and settling down for you. Now to just get you INTO that new house of yours!!! The farrier sounds like a dream come true. Glad to hear Layla's feet are all sorted out. Rio - I think your "broodmare" is getting the last laugh!!! I hope she is at least sweet and loving and a good pet, because she sure isn't "putting out"!!!! Inky - That girl she has the guts to go advertising for CHEAP board when you didn't even agree to sell the horse to her!! That is nerve!! Definitely up the price on Buster. Sounds like you have him priced way too low. He's a nice looking pony. Up his $$$ a little and see if you don't attract a better class of buyers. Oh, Inky, this new woman sounds like a piece of work. How cold. Definitely not your "warm and fuzzy" type!!! Did she e-mail you last night??? DQ - So glad to hear that you and Jag are clicking and that you are figuring out your ground relationship as well as your undersaddle relationship. It takes time. He isn't the same horse as Pokey, so your relationship won't be the same. Good luck in the show on Sunday. Get lots of pics of your pretty boy all dressed up this time. We are dying to see the handsome critter!!! Boo - Let us know how that saddle fits - fingers crossed for the perfect fit for both of you this time!!! Nope never got an email back last night, kinda glad actually! If all else fails, and he isn't sold by the time I need him, I'll go ahead and donate him to the person who asked for him for free. They're starting up a ranch adopting abused and rescued horses, and they're bringing in trainers for the unbroke horses, so that they can start up a program for 4-h kids and needy children. Which actually used to be my own dream. Boocoo, maybe it's just the areas I'm in, but that's pretty commonplace for handling horses around here and Alaska Just not on the first meeting and for checking out a new horse. But I've seen several people use the same methods on their horse to desensitize them and to keep their ground manners in line. Granted usually it's for horses much worse than Buster! luv you hit the nail right on the head. There was just something missing from this lady and it's really hard to put my finger on it! Inky - LOL No I didn't say anything yet (at least I don't think I did). It's a "Composer" by Amadeus. I saw it on eBay and it looked amazingly nice and going for very cheap, and it was brand new. The guy who sold it picked it up and some sort of auction where they auction off merchandise that the buyers never claimed and has been sitting long enough to nullify sales contract. He sells electronic testing equipment and had no knowledge of saddles, so I had to look most of it up. It turns out that the Amadeus Composer is a name some people gave who manufacture this saddle privately dreamed up. They have several nice close contact models, but this is their only dressage model. They make it exclusively in Wide and that's exactly what I needed. The ad said the seat was 17.5" so I figure even if it is a 1/2 inch too big, it will still work fine (though sitting on it on a stand doesn't make it feel big, but I need to get in on a horse). Anyway they sell it for around $800 and it was going for way lower than that on eBay, so I figured if it was total junk I could probably get my money back for it. I'm amazed. For a little, hardly known brand, it's amazing. So far I'd definitely reccomend it on looks/materials alone. Another thing I was thinking of, Ink, is that if you end up donating Buster, I know a lot of equine colleges take horses for donations that are tax deductable. The students/trainers there are usually very good with the horses they get in as doozies usually come in and bring the best out of them (as you can imagine). Anyway, quite enough rambling for now...catch you all later! Deequeue - Good luck at the show! I can't to see pictures . Dreamin' - I hope the new saddle works, it sounds nice, and it doesn't hurt that you got it at a good price . Boocoo - hope your saddle fits as well! Let us know how it goes. I have some good news too ! I am buying one of my trainer's Niederuss'. She was asking $1000 but I am getting it for $900 w/o fittings. So, I need stirrup leathers and a girth, as I have stirrups already. Any brands you all reccomend? Has anyone had experience with Soft Touch girths? They are in the Dover & SLT magazines, I believe. BTW, I need a 22" girth, and most brands I've come across seem to start at 24", so my choices might be a bit more limited. And the vet called me back, but I wasn't home, so I am calling back today. Sounds like shes been really busy. Hope you get a hold of the vet luv! If you had asked two weeks ago, I would've sent you my girth and stirrup leathers Cept mine was a 28" so sounds like it was way to big anyway lol. I'm jealous a Niederuss? Nice work! Luv, I LOVE my Wintec girth. I have a 22" as well for Layla and its really nice. Roller buckle ends, and you can just hose it off when it gets dirty, but nice enough for shows. Inky, up the price. Seriously. There are different level of people who look at horses that are priced in each bracket. To weed out people like THAT crazy lady, up his price, and make sure you dont put rescue or anything in the ad. Of course tell them if they CALL to inquire, but say hes a nice project pony thats had time off. And good news. I gingerly brought up to Sarah about what she thought about buying my saddle and how I couldnt afford to have the Event saddle and buy a dressage saddle. She said she had been thinking about it too and that she would rather just keep her saddle and buy mine and if she can make payments (which of course is fine) that she can just pay for it in full. So thats a relief. So off to saddle shop... again. I bet the people at Pelham Saddlery KNOW me by now. Yes, I think a 28" would be too big but thanks for the offer, Inky. I called the vet again today, but she wasn't working...ugh. I'll look into the Wintec girths, my friend actually has one, so I'll look at hers. Thanks . luv - Good luck with your vet! Phone tag can be very annoying. Goof luck with a girth, too! 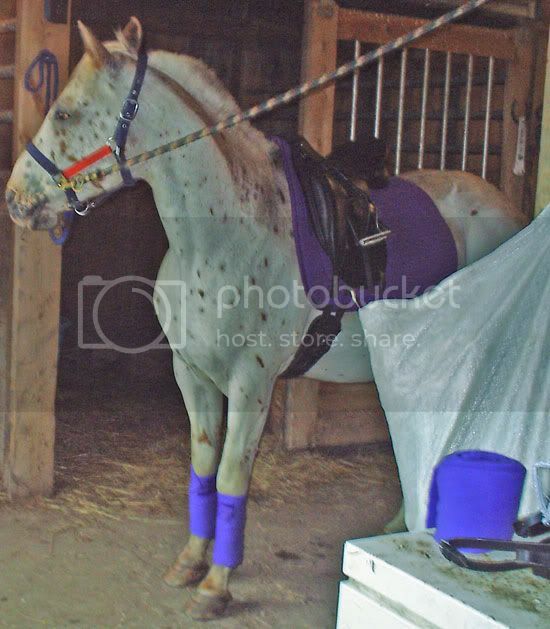 I just went through the whole "tack buying" thing as you know. For as much as I whined about it, it was actually sort of fun! Well I went to the barn today. It was pouring by the time we got up there, so I didn't have a snowball's chance of getting a ride in. I did check on Image's hoof, though, and his frog has shedded out nicely. I also got to try the tack on! So far, it's all keepers. I am only disappointed with my bridle/reins. I looked at them in good light only to realize that a gentle washing/oiling as taken some of the black paint (or whatever) off of them. *Sigh* I knew I wasn't going to get much out of it -- just as long as it lasts 'til Devon, I won't care. Saddle is a definite keeper. Inky, if you want me to move these pictures to a different (new) thread, I will. I just didn't think they were noteworthy enough for a whole new post and only the people who look here will know what's going on anyway. Anyway, pictures! Definitely not the greatest shots. 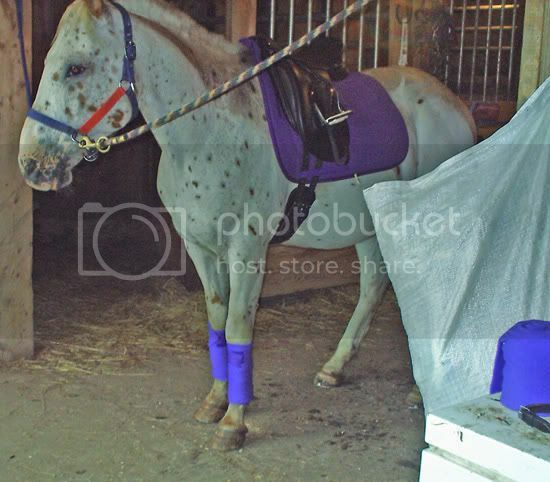 Our trash bag is in the way and so are my reins and a random polo wrap...and my polos look royal blue =(. They're actually bright purple. I love it! I could move it back more..and meh, the wrap job is sort of lacking...I guess I was just too excited! Well Inky, no offense, but anyone that handles a horse that way to me does not know what they doing. There is no reason to rough handle a horse like that. If Beau were to be handled like that, that woman would have been in the dirt. He would never tolerate it. Not to mention, it is just not necessary. Don't get me wrong, i do not tolerate a horse walking all over me, but I don't think they need to be rough handled. Reprimanded if they do something wrong, yes, but rough handled just for the sake of it, no! Well this saddle doesn't fit either. I am done. I put the medium/wide gullet in my Collegiate and he works beautifully in it. It is too low on his withers though. So I bought a riser pad today and voila', that worked. So I am staying status quo, till I can afford to pay cash for an Albion and have it properly fitted. So I need to save a bit more $$. Until then, this one will have to do. Do not sell the pony to that woman. She's trying to intimidate you. She's full of it.. and it ain't sugar. I would be personally outraged at someone coming to look at MY HORSE and doing the things she did. It's rude. It's not her place to criticize you or condem you or offer you a little money in what appears to be a concession to her own arrogance in allowing herself to buy your pony. I'm personally insulted on your behalf. Boocoo - sorry to hear this saddle didn't fit either. I'm sure it'll be extra nice when you get an Albion! I decided to sell my saddle at the consigment store, and "the saddle guy" thought they could sell it for $995 within 90 days, so I will come out with just under $800 ($796 if you want to be super exact ). Oh well...I only lost $450 (I purchased the saddle in 2004 for $1250 & used it lightly for about five months) . luv - At least you know it'll be gone! An old trainer of mine used to tell me saddles were like cars, once you sat in them, the value went way down. I guess it's better to lose $450 than to only be getting $450! Let us know how the new one is when you get it! Holy jeepers, Inky, it sounds like someone is a little too cool for school. And she was mentioned in a magazine 10 years ago, oh wow! I had people like her come look at my mare. Just remember what my farrier told me, there are more horses' rear ends in this world than there are horses! Inky, she pissed me off after your first post about her. She is rude, offensive and has no clue! Good riddance!!! Keep on trying. You will find the right home for Buster. So anyone know of a good pad to give some wither clearance. I need to find a good one until I can get the right saddle for Beau. I just don't want to shell out 2k here and 2k there and then a fortune on shipping costs. So, figure I'll wait till I save a bit more and have it done right, once and for all. My current saddle fits and he works great, except for not enough wither clearance. HUGE DITTO!!!! I recently had a person from a different discipline background look at our very willing 1st/2nd level 6 year old with solid leg yeilds and shoulder ins. She halted and did something to which our sweet 6 year old decided he didn't know what it meant. "He doesn't know how to leg-yield, does he?" she asked. I simply agreed that he did not and that she probably didn't want such a poorly trained horse. Inky, she is either just rude all the time OR she is trying to low ball you. Silly woman is perhaps hoping that if she bad mouth's your horse enough you will be glad to have such a generous person take him off your hands. Run away, far far away! Hopefully, upping Buster's price will bring out a better quality of inquiries. BTW: What does a woman raising and training quarter horses need with a pony? Riotoller.....That was so funny!!! LMAO!!!! If I ever have to deal with something like that, I will be sure to call you!! lmao! Dear Lord what is wrong with people these days!! Nice response to that email Rio! That gave me a good laugh! I just read that the new saddle you just bought doesnt fit your horse?? I was looking for a dressage saddle and found an incrediably lovely Albion for an amazing price! It's used.. I can get you the website if you are interested.